Qinawi, a crippled newspaper vendor working in the Cairo train station, becomes infatuated with Hannuma, an engaged beverage seller. When Hannuma rejects Qinawi’s fantasy of their future together, Qinawi’s obsession turns into madness. As Hannuma’s fiancée, Abu Siri, tries to unionize the station workers, Qinawi plots to murder Hannuma by luring her to a warehouse. However, he stabs the wrong woman and stashes her body on a train car destined for Hannuma’s wedding. Still alive, the woman identifies Qinawi as her attacker once she is found, although Hannuma is unaware that she was the original target. Pursued by the authorities, Qinawi takes Hannuma hostage until he is convinced he will be allowed to marry her and is coaxed into wearing a straitjacket, believing it is a wedding suit. According to the director, Bab el-Hadid was intended to discuss social realities through a personal prism. This melodramatic neo-realist film was entered into the eighth Berlin International Film Festival. It was additionally selected as the Egyptian entry for the Best Foreign Language Film at the thirty-first Academy Awards, although it was not accepted as a nominee. Bab el-Hadid, also released under the names Central Station and The Iron Gate, launched Youssef Chahine’s directing career from innovative newcomer to internationally recognized auteur. Gordon, Joel. 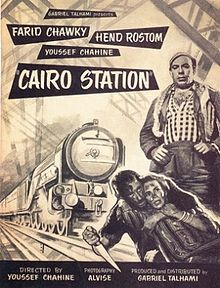 Broken Heart of the City: Youssef Chahine’s Bab al-Hadid (Cairo Station). Journal for Cultural Research, Vol. 16, No. 2-3 (April – July 2012), pp. 217-237. Gordon, Joel. Chaos and Cinema: A Revolutionary Coda. Bustan: The Middle East Book Review, Vol. 4, Iss. 2 (2013), pp. 99-112. Massad, Joseph. Review Essay and Interview: Art and Politics in the Cinema of Youssef Chahine. Journal of Palestine Studies, Vol. 28, No. 2 (Winter 1999), pp. 77-93. Samak, Quassi. The Politics of Egyptian Cinema. Middle East Research and Information Project, Inc (MERIP) Reports, No. 56 (April 1977), pp.12-15.